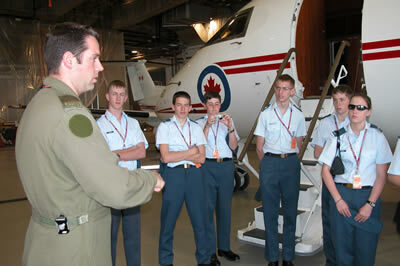 The squadron provides a comprehensive flying scholarship ground school for those cadets who are interested (and eligible) in pursuing a flying course within the Air Cadet Gliding Program. Annual scholarships for glider and power pilot courses are available, and both are covered within the syllabus. The class sessions are held during the first school semester (Sept-Jan), on Wednesday evenings at the Armoury, from 18:30-21:00 hours. The course is based on the content of the industry standard reference entitled “From the Ground Up”, and participants are encouraged to read the related sections of the text to augment the class discussion. The course instructors have a wide range of experience covering various aspects of flying, including civil, commercial, military, bush, sport and glider towing. Aircraft ownership, operation and maintenance are also included. The instructors rotate in order to provide different perspectives to the participants. The course culminates with mock exams at the end of December, followed by preparation for the provincial qualification exam in early January. The final phase is interview coaching which helps the candidates to place their academic learning into context within the overall scholarship decision making matrix. The interviews are held during early February and successful candidates are moved forward for potential selection as an award recipient.